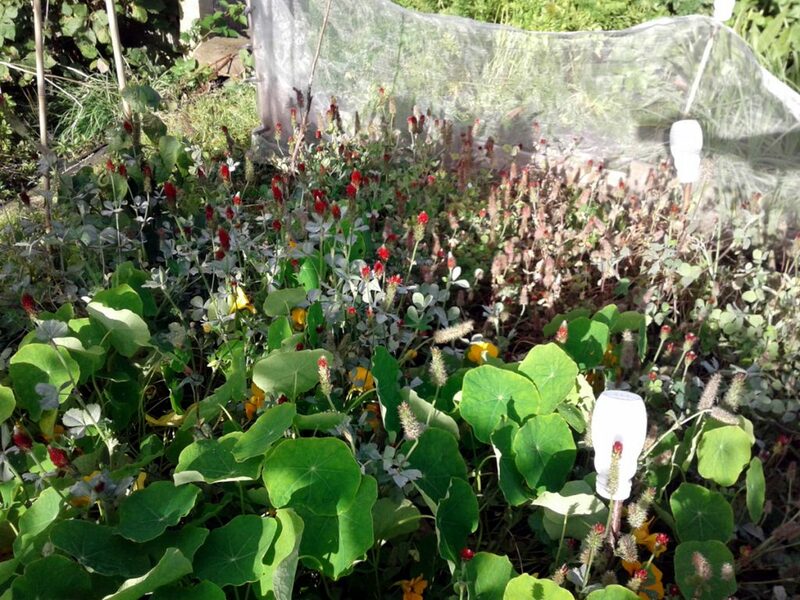 Last year I volunteered to take part in a growing trial for Garden Organic. 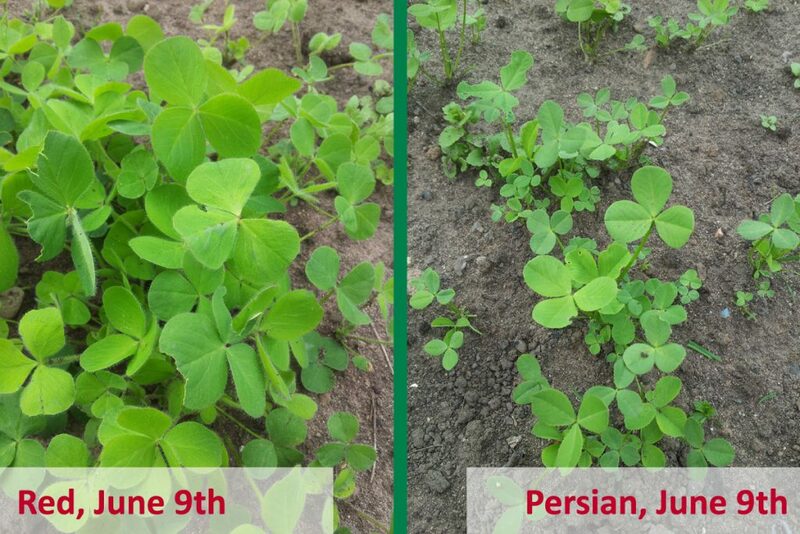 The aim of the trial was to assess the suitability of Persian Clover (Trifolium resupinatum) as a green manure crop, against the more regularly-used Crimson Clover (Trifolium incarnatum). In my last update, back in October, I suggested that it wasn’t looking good for the Persian variety. The year-long trial period has now come to an end, and I have to say the situation really hasn’t improved. 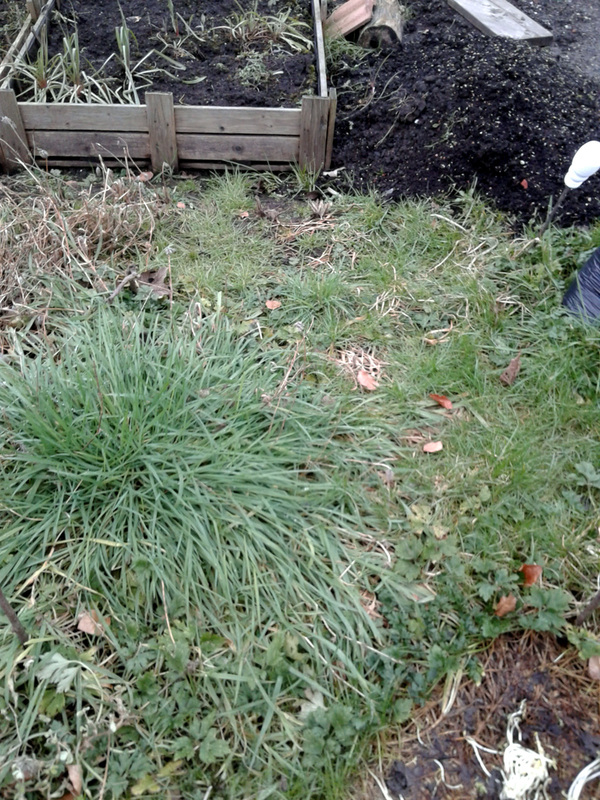 No sign of the Persian clover, just grass and weeds. As you can see, the clover has all-but disappeared, and the Poa annua grass, Ranunculus repens creeping buttercup and other assorted weeds have moved in en-masse. Mostly clover straw and weed seedlings here. Again, there’s a fair bit of weed growth in evidence, but the clover straw remains and will at least be usable on the compost heap. On the evidence of the above photos, it’s very tempting to suggest that Persian clover isn’t such a great green manure crop after all. However, there are a few provisos that need to be taken into account before drawing any firm conclusions. Obviously, this is just a single result from one particular site. A rather windy, weed-prone site at that. Garden Organic will be collating results from all their participants and I’ll be very interested in seeing the aggregate view in due course. 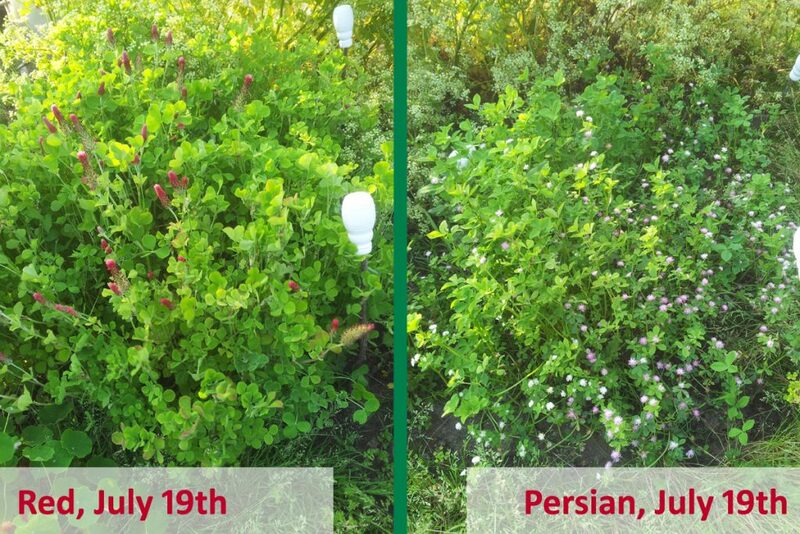 Garden Organic asked participants to run the trial for a whole year, specifically to assess whether the Persian clover would degrade better than the Crimson, which does tend to leave straw behind. On the evidence of my own trial I’d say that yes, it does. 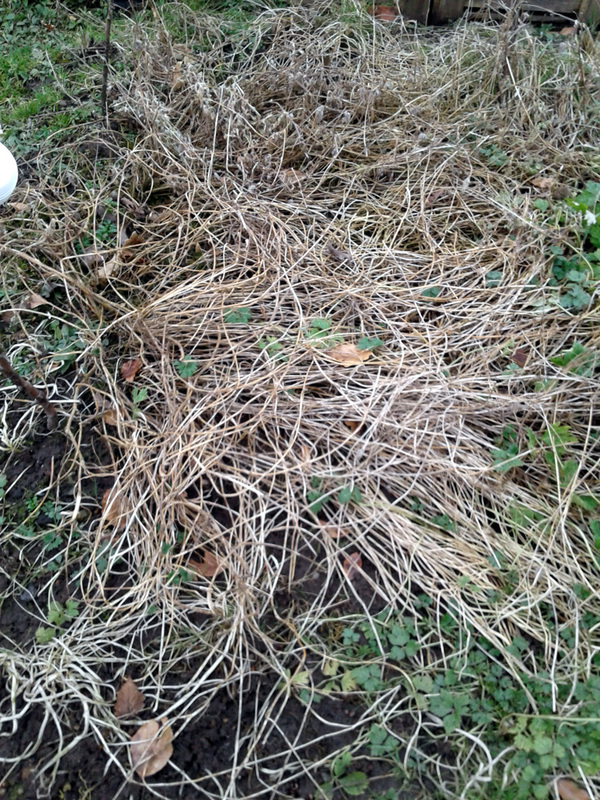 The problem being that it degrades too quickly, leaving bare soil behind for weeds to colonise. But that’s not how green manures tend to be used, at least not on a small to allotment-sized scale. Rather, the crops are grown to the point just before they set seed – or earlier if the ground will be needed for sowing or planting sooner – and then either dug into the soil (or maybe shallow-rotovated, or just cut back and allowed to decompose on the surface, if you practice a no-dig methodology – discussions are ongoing). The idea is that their green growth provides organic matter to improve soil structure, and eventually degrades to release nitrogen and other minerals. That being the case, there may be an argument for Persian clover being sown, as long as it was dug in at the appropriate stage. 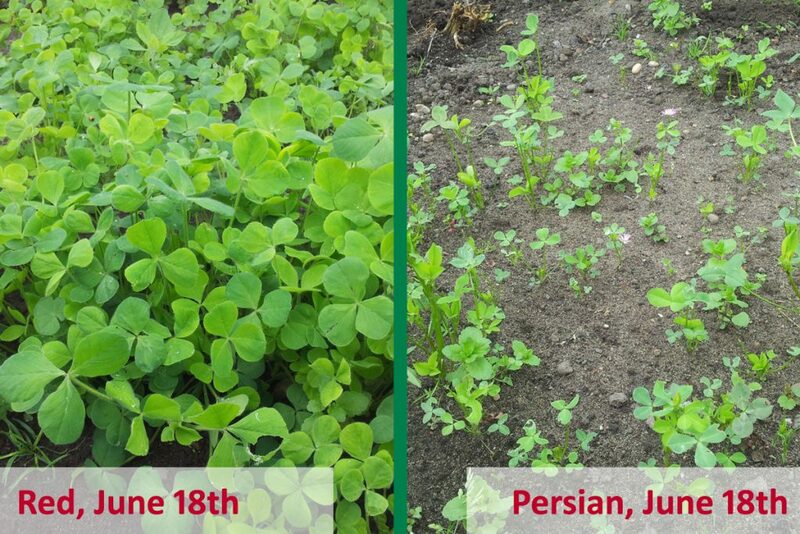 However, based on the update I posted last August, I’d have to say that, on our site at least, Persian clover is too slow to germinate and develop to be of any real use. It would still allow annual weeds to establish and potentially set seed before it had established enough ground-cover foliage to prevent the weeds from getting started. 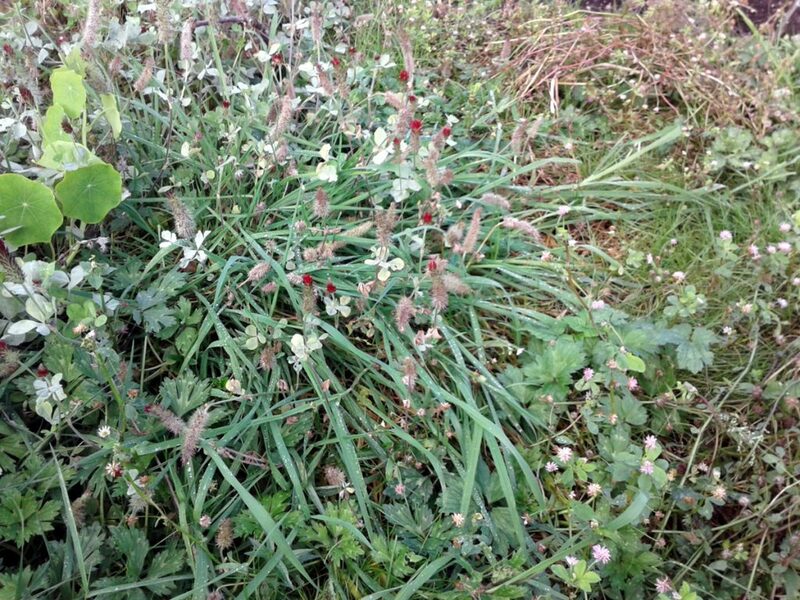 To summarise: I, personally, wouldn’t use Persian clover as a green manure on our site. Not when the stronger, faster-growing Crimson variety does a much better job of quickly covering the ground and puts on a lot more soil-boosting foliage in the process. Digging in the Crimson clover at the appropriate time would avoid the issue of tough straw lingering and being slow to decompose in the soil. This year, I’m running another trial on behalf of SoilFixer.co.uk, testing the efficacy of two of their soil improvement products. Details of the initial setup can be found here. I’ll also hopefully be taking part in a wildflower growing and bumble bee counting project for Garden Organic. Details to follow. This year I’ve been trialling two species of clover on behalf of the folks at Garden Organic. The idea of the trial is to assess the usefulness as a green manure of a relatively new (to the UK) species, Trifolium resupinatum (Persian clover) as opposed to the more widely-known and commonly used Trifolium incarnatum (crimson clover). The crimson clover is still growing strongly, despite the best efforts of the invading nasturtiums. As you can see, the crimson clover is still doing well. The plants are thick and healthy and those flowers have been magnets to the local bumble and honey bee populations for a couple of months, and show no signs of slowing down or dying back. The Persian clover seems to have thinned out already and is in danger of being over-run by weeds. By contrast, the Persian clover isn’t looking anywhere near as healthy. The plants are much thinner on the ground, and the patch that I sowed has been colonised by Poa annua (meadow grass) and Ranunculus repens (creeping buttercup) – a perennial problem throughout our plot – as well as a few spikes of crimson clover from the patch next door. I realise that this is just one trial, on one plot, in one part of the country, so there are an awful lot of localised soil- and weather-condition variables in play. Obviously I’d need to see the results of the Garden Organic survey as a whole to draw any firm conclusions. But based on the results of my own small experiment, I’d be reluctant to choose Persian over crimson (or white) clover as a green manure crop in future. 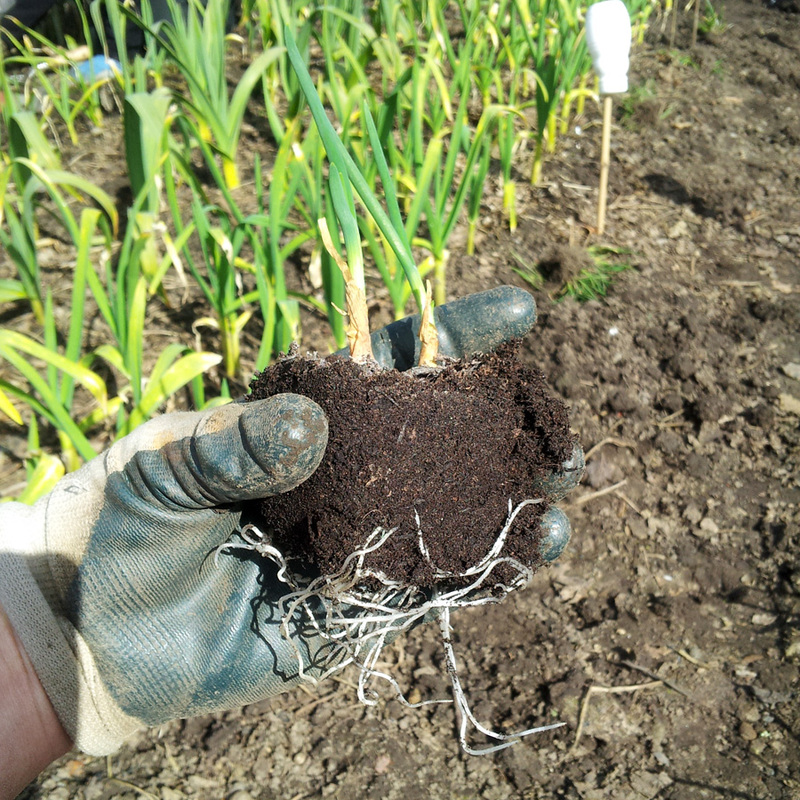 Although having said that, green manure is meant to be dug in when it reaches maximum foliage and before it flowers and sets seed, rather than left for a full year as requested here; Garden Organic are also interested in how well the dead plant matter rots down into the soil. Then again though, those earlier pictures show that crimson clover put on a lot more growth a lot quicker, creating a lot more organic matter to be dig back into the soil, or cut down and used as a surface mulch. I’ll continue the trial over the winter and see what happens to the two patches once the clover does die down, but I rather suspect that the Persian section will be overcome with weeds to the point where it will be difficult to tell what’s happening to the decomposing stems. We’ll see what happens in due course. This year I’ve joined in with a trial of two varieties of clover organised by Garden Organic. 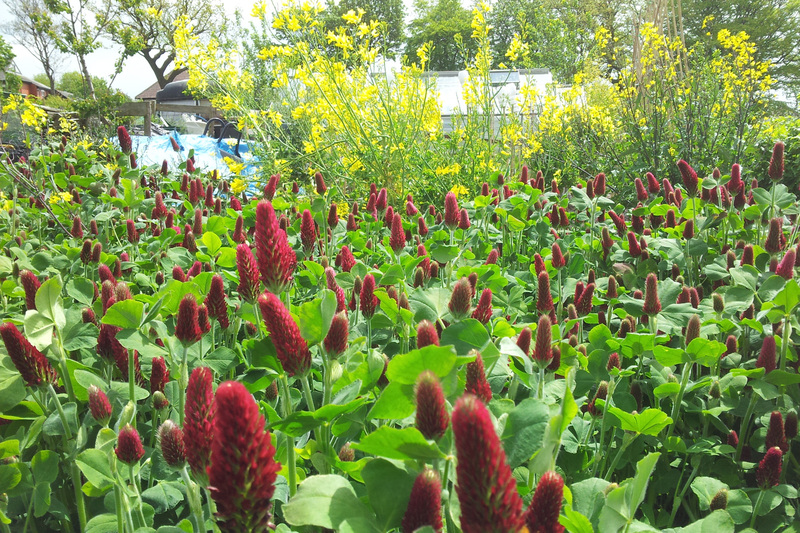 The aim is to see whether Persian clover (Trifolium resupinatum) is an effective green manure, in direct comparison with red crimson clover (Trifolium pratense incarnatum). As instructed, I first sowed two patches of clover seed – one red, one Persian – back in March. The weather was so poor that the seed failed to germinate, apart from a few tiny stragglers, so I dropped Garden Organic a line and offered to re-sow. They sent me some more seed in May, I sowed when the weather had improved a bit, and I’m glad to say that this time the seed germinated nicely and I’ve been tracking progress in photos since then. I’m afraid that although I read the trial notes thoroughly when they arrived, I’ve forgotten to take measurements, or including measuring marks in the photos. Easily done when you’ve got 1,001 other things to be remembering and thinking about during an allotment session, and hopefully my observations will still be useful. Both varieties have germinated, but already the red clover is much more vigorous and robust-looking than the thinner, patchier Persian. Nine days later and whilst the red clover has expanded to fill most of the metre-square patch, the Persian is now lagging badly behind, leaving lots of gaps for weed seeds to colonise. The Persian has finally started to thicken up a little and is already flowering, producing delicate, daisy-like, flat-faced white flowers edged in pink, nothing like the tufted flower heads that you usually expect to see on native clover. A week later and the red is now showing the classic clover flower spikes, and the Persian has thickened a little more. I’ve had to do quite a bit more weeding on the latter though, due to the comparative sparseness of the foliage. Both varieties are now at full strength. The bees are loving the flowers and the foliage is rich and lush. The photo shows that the red is still out-performing the Persian in terms of size and vigour. Assessing growth rate and coverage are only part of the trial though. Another element is to see what happens once the plants die back in winter. 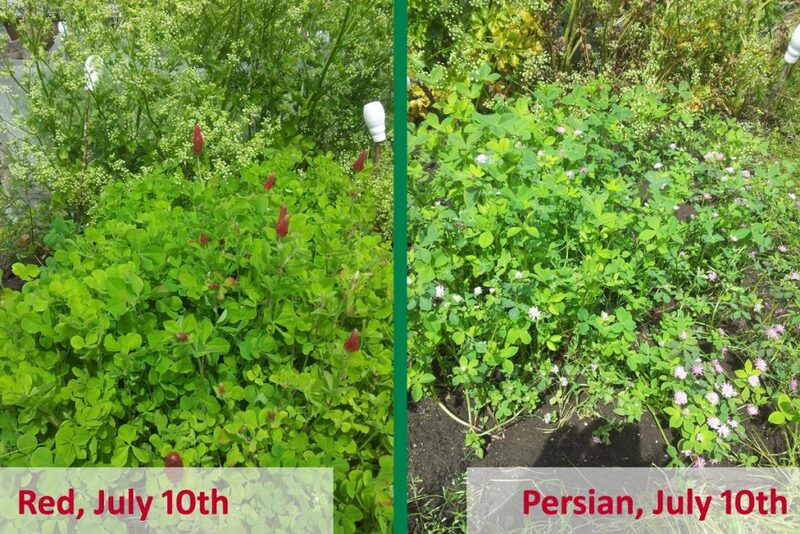 The theory is that the Persian clover will decompose much more quickly than the red, leaving a lot less ‘straw’ to be manually dug in to the soil. Based on my previous experience with red clover, I’d imagine that both will set seed and we’ll be looking at another batch of clover coming up in the same place once the weather warms up next Spring. 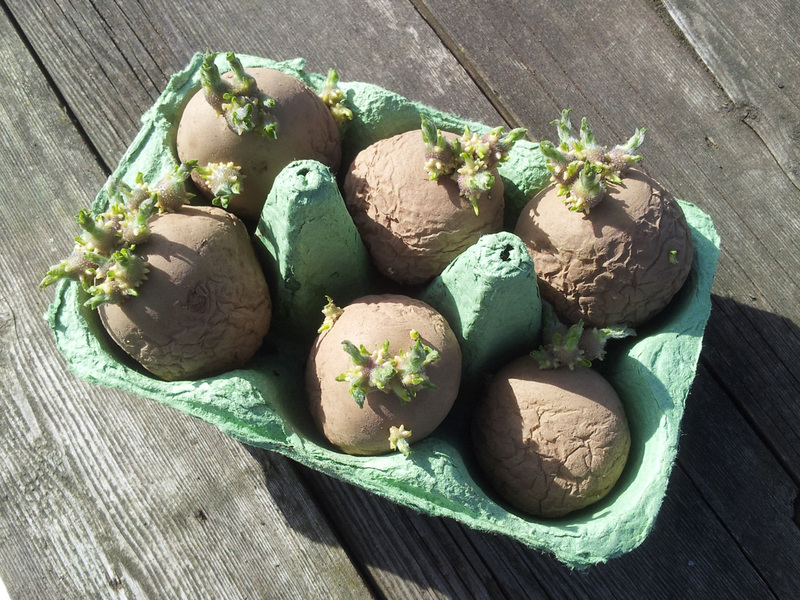 This morning I cleared the final stragglers – some non-producing purple sprouting broccoli and a few pigeon-knackered kale plants – from the main veg section down on Plot #59. Having found a bit of clubroot in the p.s.b. and not wanting to risk spreading it to this year’s brassicas, I decided that the newly-cleared section would make an ideal location for the green manure trial that I’m carrying out for Garden Organic this year, which will run through to March 2017. Newly cleared, raked, sown and watered experimental trial patches. 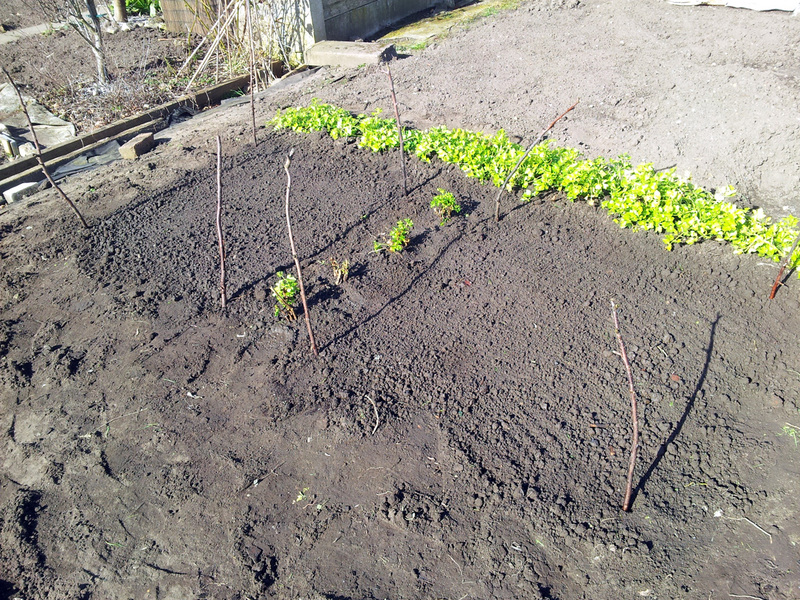 That’s two one-metre square plots (with some celery that survived the winter relocated as a boundary marker and a few parsley plants to keep them apart) freshly cleared, raked and sown with the seed provided. I noticed that the Persian clover seed was quite a bit smaller than that of the red clover; I expect that means the red will be a more robust plant than the Persian? Time will tell and I’ll be keeping track of progress as the two patches develop. When I signed up for Garden Organic‘s Heritage Seed Library earlier this year, I ticked a couple of boxes on the form to indicate my general willingness to take part in their 2016 trials programme. As well as participating in a seed-saving survey, I also said I’d like to help trial a potential new green manure seed: Persian clover (Trifolium resupinatum, meaning ‘having the appearance of being upside-down’). As I’m sure most gardeners and plot holders are well aware, green manure is any one of a range of fast-growing crops that’s intended to cover a patch of otherwise un-used ground. 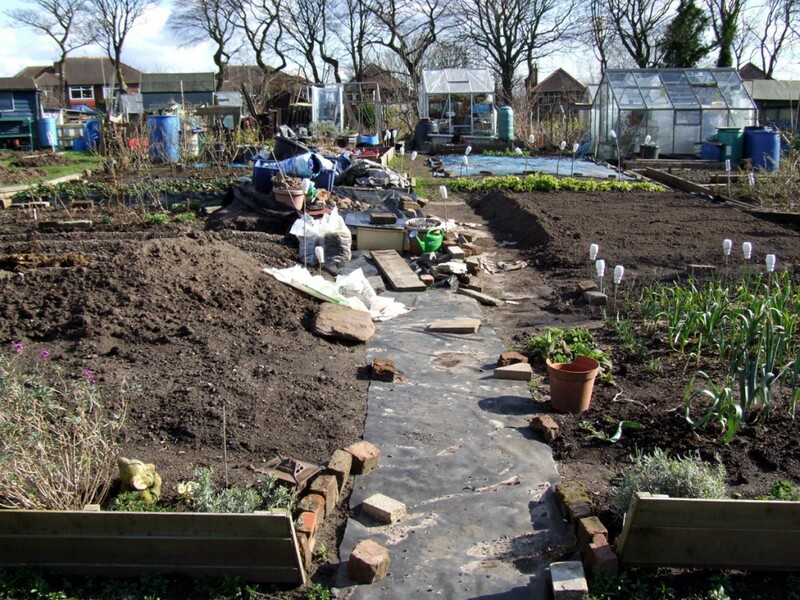 The plants help to keep weeds down and then can be dug in to provide compost matter and food for worms, both of which help to improve soil quality. 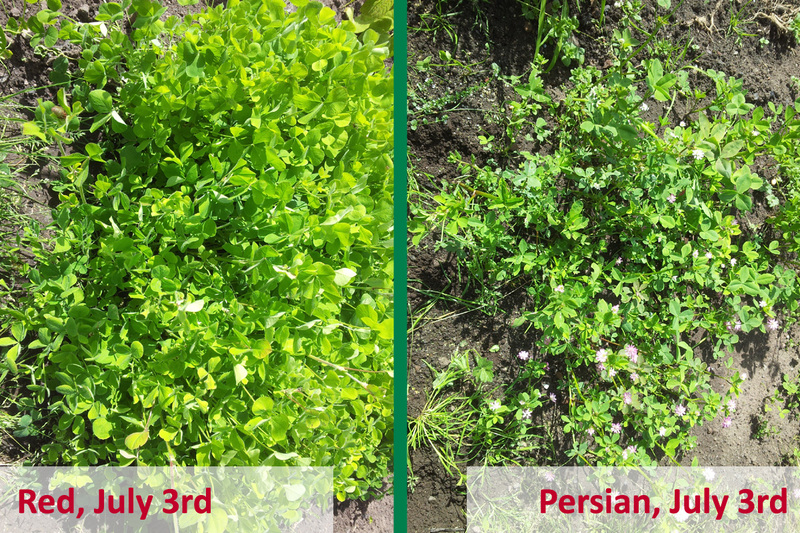 According to the notes from Garden Organic, Persian clover – which is widely grown as a fodder-crop – is meant to be a little more no-dig-friendly, as the stems are quicker to rot down and can be left on the surface for the worms to deal with; unlike the red clover steams which tend to dry to a straw-like consistency and don’t incorporate into the soil unless you do dig them in. 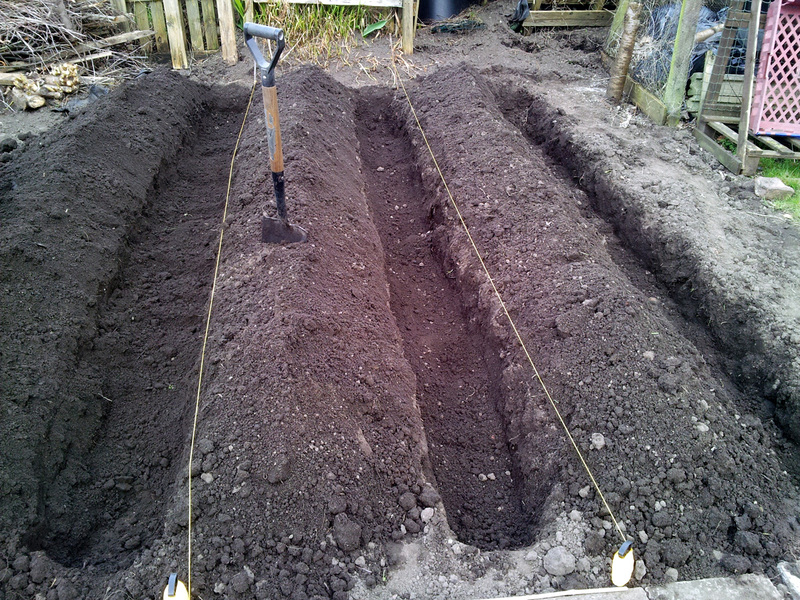 The seeds need to be sown in mid-March, so I’d better get my skates on and decide where I’m going to put the two one-metre trial sections on the plot. I’ll be sure to take plenty of photos and record my progress as I go, with further updates here as the two clover crops develop. If you’re interested in using green manure on your own plot or garden, take a look at the range of seeds available from sowseeds.co.uk sub-site www.greenmanure.co.uk, which is who we bought our red clover seed from, and read their notes on choosing the right green manure to see what’s best to sow where, when and why.